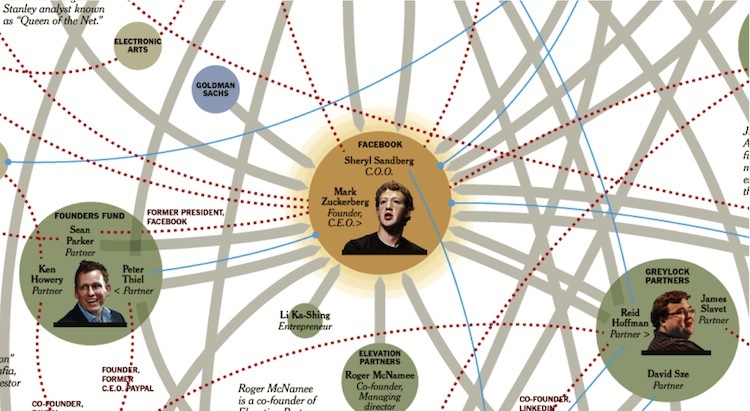 The mystifying web of who is investing in which companies and who is sitting on what boards. To illustrate just a little bit of the six degrees of separation you can play with these companies and their investors, let’s trace a path (deep breath). Sherly Sandberg, a former Google employee, is now the C.O.O. of Facebook. She also serves on the board of Starbucks, whose CEO, Howard Schultz, is the founder of the VC firm Maveron, which has invested in Groupon, where Schultz sits on the board. He’s joined on that board by Kevin Efrusy, partner at Accel Partners, the former employer of Benchmark’s Fenton, Benchmark has invested in Twitter, and, you’ll remember, Fenton sits on the board. Twitter’s creative director is Biz Stone, who used to work at Google, the former employer of Sheryl Sandberg. And round and round we go. Is this different from any other close-knit industry? Probably not. Is it important to know that a relatively small cabal of decision makers is pumping more and more money into a pretty small industry–though it’s an industry we all happen to be eating up? If these five companies and the smaller companies that are floating up on their rising tide become to corporate juggernauts of the future, the IBMs and the GEs, well, then this will look like a web of geniuses. And what if this turns out to be another tech bubble that brings our economy down with it if people decide to stop playing FarmVille? Well, in that case, come back and find this graphic for your list of people to blame. They’ll all still be rich.